This 1/8" x 1/8" x 1/16" Flat Top V-Notch Economy Trowel is designed for direct glue-down texture and secondary-backed carpets. 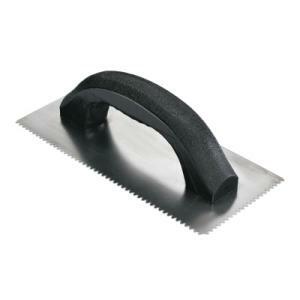 The full, cold-rolled steel blade, high impact black plastic handle and 9" x 4" size make this tool easy to use. 9 in. x 4 in. We pour the adhesive on top of the clean, dry 12" wide seam tape and use these trowels to evenly spread the adhesive around. The 1/8" V notches allow just the right amount of adhesive for proper bonding. The 1/16" tip size lets us move excess adhesive to a dry part of the seam tape. TJB-INC does not clean or re-use our trowels after a senthetic putting green or turf installation. Because the price point of these trowels is so low, it is more cost effective to throw it away than to spend time & labor cleaning them.